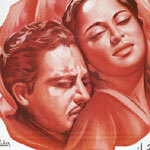 "Kagaz Ke Phool" is a 1959 hindi film which has Guru Dutt, Waheeda Rehman, Baby Naaz, Pratima Devi, Mahesh Kaul, Veena, Mehmood, Johnny Walker, Minu Mumtaz, Nilofer, Sulochna, Sheela Vaz, Vikram Kapoor, Mohan Choti, Haroon, Tony Walker, Ratna and Tun Tun in lead roles. We have 2 songs lyrics and 2 video songs of Kagaz Ke Phool. S. D. Burman has composed its music. Geeta Dutt and Mohammad Rafi have sung these songs while Kaifi Azmi has penned its lyrics.